It's been a while with a blogpost, and this time its APEX, One of my favorite product from Oracle. Oracle 11g XE is quick to download from OTN and install in the laptop for trial & learning purposes and many of us already have this installed in laptop and use it for creating small applications for our own use. 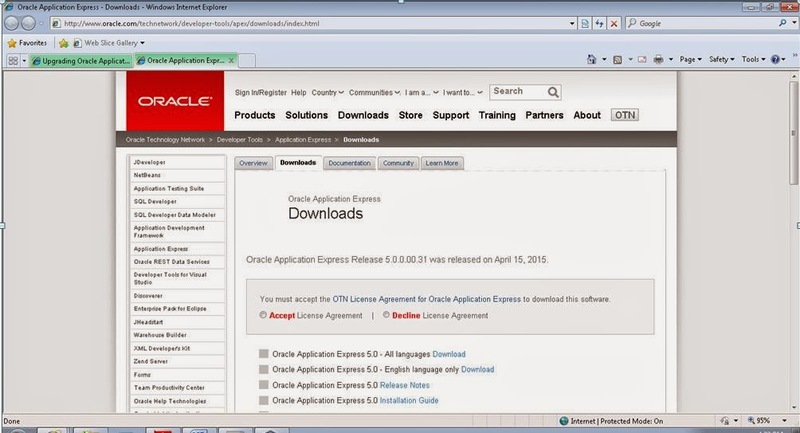 Scenario:- Today, I had to install a packaged application provided by Oracle into my express edition. By default the APEX version in express edition is 4.0.2.00.09, When I was trying to import the packaged application into my 11g XE database, It was failing with an INCOMPATIBLE error. I did careful reading through the details of packaged application which clearly mentioned Oracle developed the application in APEX version 4.2 and thus my XE APEX version of 4.0 was incompatible. I did not want to install a 12c R1 database which by default comes with APEX 4.2, Instead decided to upgrade the APEX version in XE to newly released 5.0 version directly. This post shows step by step method to upgrade our APEX from version 4.0.2.00.09 to 5.0.0.00.31. 3. Start CMD prompt and Change your working directory to apex. After the APEX 5.0 upgrade my packaged application import was smooth without any issues. "There is a problem with your environment because the Application Express files have not been loaded. Please verify that you have copied the images directory to your application server as instructed in the Installation Guide. In addition, please verify that your image prefix path is correct. Your current path is /i/ (it should contain both starting and ending forward slashes, such as the default /i/). Use the SQL script reset_image_prefix.sql if you need to change it." now what i have to do. Did you execute apxldimg.sql ? Fantastic! Worked like a dream! http://127.0.0.1:8080/apex/f?p=4050 access the administrative services page.